California Linen Services is proud to announce its recent award for “Corporate Citizen of the Year” by the City of Pasadena. 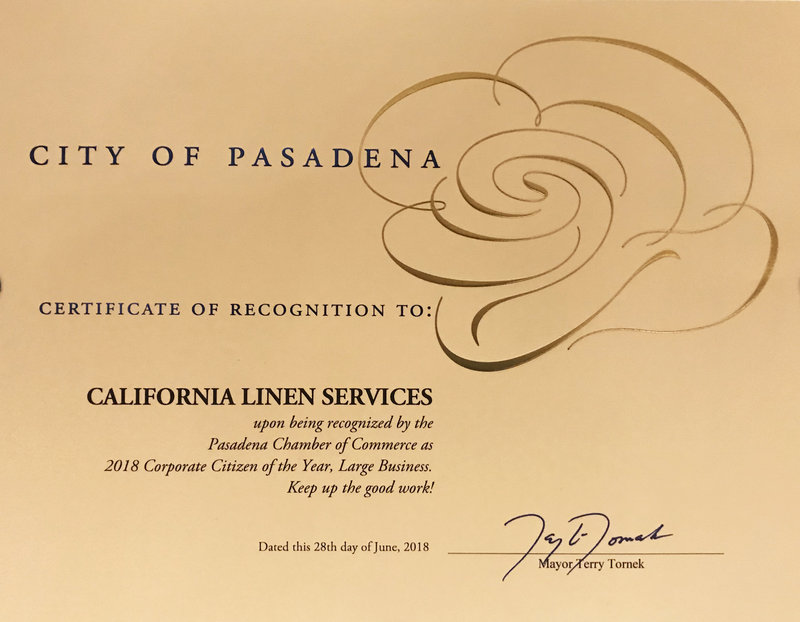 On June 29, 2018, the City of Pasadena awarded California Linen Services with the award, which recognizes outstanding service to the local community and surrounding areas. Awards were presented at the annual Inaugural Gala at the Langham Huntington Hotel, hosted by the City’s Chamber of Commerce, with over 200 leaders from the business community in attendance. California Linen Services has been family-owned and operated since it opened its landmark location in 1938 in the heart of Pasadena. Past recipients of the “Corporate Citizen of the Year” award include Kaiser Permanente, Huntington Hospital, Wells Fargo, Huntington Medical Research Institutes and Pasadena Tournament of Roses.